Air transport services are governed by a specific annex of the General Agreement on Trade in Services (GATS). The annex excludes from the agreement the largest part of air transport services: traffic rights and services directly related to traffic. These services are nevertheless subject to a regular review by the Council of Trade in Services, with a view to considering the possible further application of the GATS to the sector. A first review took place in 2000-2003. The second review is on-going. In preparation for the second review, the WTO Secretariat developed the Quantitative Air Services Agreements Review (QUASAR) database and methodology to assess, on a universal scale, the degree of liberalization achieved by the air transport sector. The Secretariat also produced the Air Service Agreements Projector (ASAP), an analytical tool that allows for the visualisation of elements of the QUASAR database, notably information on an economy's network of bilateral Air Services Agreements and correlated traffic flows. On 16 January 2013, the Secretariat released an update to its ASAP tool, based on 2011 regulatory and traffic data. An analytical tool that allows for the visualisation of elements of the Quantitative Air Services Agreements Review (QUASAR) approach devised by the WTO Secretariat. The ASAP allows to select bilateral ASAs on the basis of a number of criteria, namely combinations of signatories and regions, levels of openness, types and traffic levels. Once selected, these ASAs will be charted on a map and the underlying relevant data will be displayed. 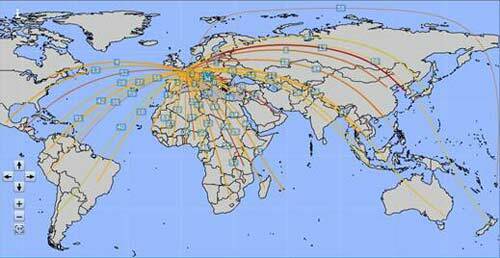 View of the total air traffic worldwide over a 24 hour period, projected onto a world map and reduced to 1 minute. Each yellow point represents a plane. In the Uruguay Round, negotiations focused on aircraft repair and maintenance services, computer reservation services, selling and marketing of air transport services. For consolidated information on countries’ commitments and exemptions on air transport services go to the services database. If you are seeking the commitments of a specific WTO member, go to “Jump to a specific sector for a given Member”, select air transport services from the sector dropdown list, select the Member of interest and click “go”. To see a table showing which Members have made commitments in air transport services choose “See which Members have made commitments in a specific sector”, select Air transport services and click “go”. Air transport services are included in the new services negotiations, which began in January 2000. In November 2005, WTO members collectively identified their sectoral and modal objectives for negotiations on air transport described in document TN/S/23 (para 17, page 20). In March 2006, a group of members prepared plurilateral request calling for extensive commitments in five sub-sectors, namely aircraft repair and maintenance, selling and marketing, computer reservation services, ground handling services and airport operation services. These include full commitments (when technically feasible) on Mode1 (services supplied from one country to another) and on Mode 2 (consumers or firms making use of a service in another country) and elimination of economic needs tests (a test using economic criteria to decide whether the entry into the market of a foreign firm is warranted and restrictions on foreign equity participation for Mode 3 (a foreign company setting up subsidiaries or branches to provide services in another country). Air transport is subject to a specific review process. Paragraph 5 of the Air Transport Annex states that “the Council for Trade in Services shall review periodically, and at least every five years, developments in the air transport sector and the operation of the annex with a view to considering the further application of the Agreement to the sector”. The first review was held between 2000 and 2003. Air Transport and the GATS: 1995-2000 gathers together the extensive background documentation produced by the Secretariat on the developments in the sector for the period 1995-2000. A report by the Council of Trade in Services includes submissions made by members and observers during the first review as well as its proceedings. The second review was formally opened in September 2005. In preparation for the second air transport review mandated by the General Agreement on Trade in Services (GATS) Annex on Air Transport Services, the WTO Secretariat gathered together in this publication the documentation produced in 2000-2001 for the first review.